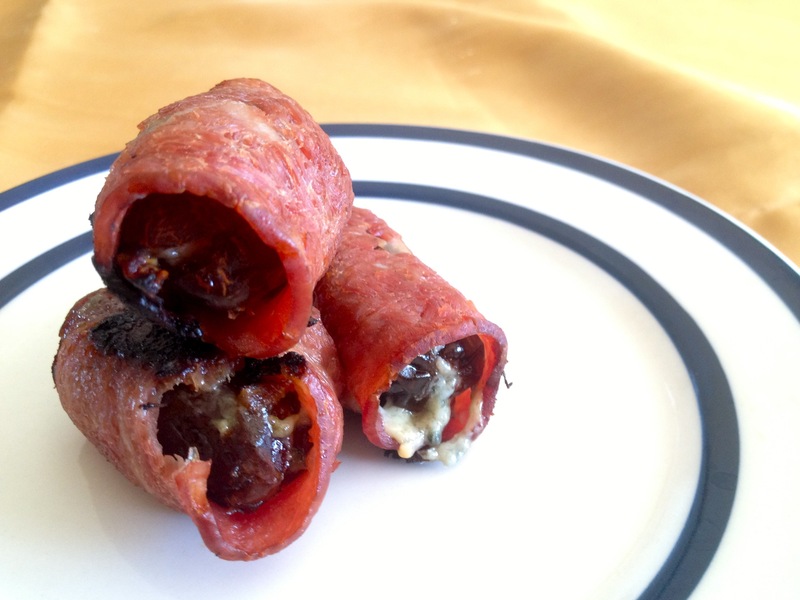 In honor of the Superbowl and the end of my strict January diet, I decided I would treat Mike and I to one of my favorite bite-sized morsels: Bacon, Blue Cheese Dates. I copied these from a delicious restaurant in Boston: The Regal Beagle. I visited a couple of years back with some good friends of mine and fell in love. These violate my “no cow diary” rule but the dates are good for you and the organic turkey bacon is too! And holy bajolies they are tasty. The blue cheese gets kind of muted when you cook it so it doesn’t have the bitter after taste, all you get is the sweet of the date and salty of the bacon. YUM. Stuff blue cheese inside the cut dates. Only enough so that the dates can still close. Cut the bacon in half and wrap it around the dates. Bake for 10-15 minutes until bacon is done. This entry was posted in Nutrition, Recipes and tagged Bacon, Blue cheese, Boston, Cheese, Cooking, easy, happy, Healthy, Home, Kitchen, life, Quick, Savory, Snack, Super Bowl on February 5, 2013 by ahappylass.